Early flights of childhood fancy were followed by deeply imagined worlds and finally by lasting works of literary genius. Such was the case of the talented Brontë sisters. 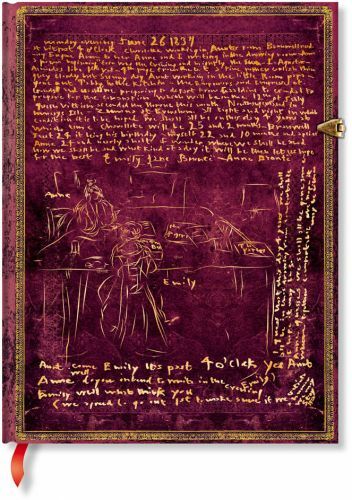 This Special Edition journal features a page from one of the diaries kept by the feverishly creative Brontë children. This page is illustrated with rare drawings of Anne and Emily Brontë and the tin box in which the children kept their papers. The early writings of the sisters and their brother, Branwell, included the chronicles of two elaborately detailed fantasy worlds - Gondal and Angria. Later, the Brontë girls, who lived in isolation on the Yorkshire moors, began to publish poetry under the pseudonyms Currer, Ellis and Acton Bell. While in their twenties, the three girls each published novels, including Jane Eyre, Agnes Grey and Wuthering Heights. By 1848 they seemed poised for successful literary careers, but within months Branwell, Emily and Anne all died of tuberculosis. Charlotte wrote two more novels before succumbing to the same disease in 1855. Their legacy is one of the most revered in English literature.